We have a group to fit your every need - from 4 singers up to 400, we'll take care of your entertainment needs. We rehearse weekly, unless we are performing for groups in and around Tyler, Texas. We occasionally take longer trips to attend division and district conventions and competitions, but you can usually find us at the Green Acres Baptist Church on Thursday evenings, honing our skills under the expert leadership of our talented director, Richard Light, and our assistant director, John Cavanaugh. We also have several performances throughout the year at regional venues, and regularly sing for community events and functions. Visitors are welcome to join us as we rehearse, since we always enjoy singing to an audience. We also invite men who enjoy singing to come and listen, and hopefully, join us on the risers. We are always looking for new talent. Members are not required to be able to read music, but a good ear is always beneficial. 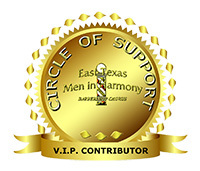 The "East Texas Men In Harmony" is an all-male a capella chorus that sings in four-part barbershop harmony from all over the East Texas area, representing over 20 towns in the Greater Tyler area, and as far away as Lufkin and Nacogdoches. Our members come from all walks of life, and represent all age groups. The love of Barbershop Harmony brings us together to sing at civic clubs, corporate parties, awards banquets, and anywhere else people gather for an evening of musical enjoyment. The chorus is an affiliated chapter with the International Barbershop Harmony Society, with over 750 chapters and 24,000 members.